George, as he was generally known, was an Eton Wick boy and man. He was the fourth son in a fairly large family, born on August 3rd 1891 and baptized two months later on October 4th. His father, Edward George, had built the family home in Moores Lane known as Myrtle Cottage, and Henry George, with the others in the young family, enjoyed their early Childhood in this rather remote house on the edge of recently developed Boveney Newtown. Some years later the family moved to number 3, Castle View Villas in Sheepcote Road, Eton Wick; these houses are not to be confused with Castle View Terrace in Victoria Road. Like his brothers, he attended the infant school at Eton Wick, and when seven years old he went to Eton Porny School to complete his education. He left school in July 1905, a few days before his 14th birthday. It is not known what work he pursued for the next nine years, or exactly when he enlisted in the Royal Army Service Corps. Certainly, George was a soldier by the spring of 1915 when his name appeared in the Roll of Honour of the May issue of the Parish Magazine. At the end of the first year of the war, there were 258 serving soldiers and 48 sailors from the Parish of Eton and Eton Wick. Included at this time were three Moss brothers. William was in the Royal Engineers; he survived the war but sustained a gunshot wound to the knee in 1915, and Edward, who served with the 3rd Battalion Grenadier Guards, also survived the war. Along with Henry George, there were three other brothers, six in all, and a sister. The 50th Division, otherwise known as Northumbrian Division, was part of the pre-war territorial Force; there is, however, no evidence of George having been a territorial soldier himself. The 50th Division Motor Transport (M. T.) Company was part of N Corps M. T. Column, serving Xlll Corps. The Northumbrians were at the Second Battle of Ypres in April and May 1915 and on the Somme during the latter stage of the battles, between September and October 1916. They were engaged again in the Battle of Arras in April 1917, and at Passchendaele in October and November of the same year. They fought at both St. Quentin, in March 1918 and on the Lys the following month. This was during the great German offensive throughout the spring and early summer of 1918, when the outnumbered British and French forces withdrew from previously hard won territory. Following the collapse of Russia, large numbers of enemy troops had moved to the Western Front and shifted the balance of power in favour of the German army. The 50th Division was one of several sent to a normally quiet sector on the Chemin des Dames to rest and regroup, only to be hit hard by the third stage of the German onslaught at the end of May. The enemy attacks finally slackened and were held in July, until a week or two later the final allied advance reversed the situation. The Division subsequently took part in the storming of the once impregnable Hindenburg Line in October as part of the Xlll Corps, Fourth Army, on the Somme. 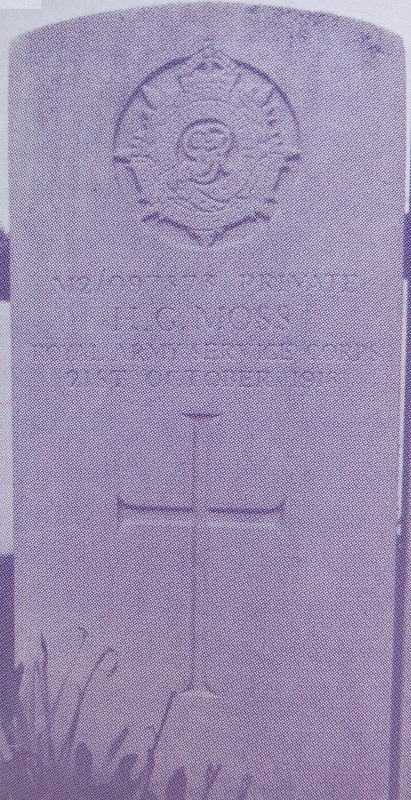 Moss H. G. of Myrtle Cottage, Eton Wick, the fourth son of Mr and Mrs Moss of that address, died at a Casualty Clearing Station in France of bronchitis and influenza on October 21st 1918. He had seen many of the great battles fought in Europe during four years of war, and the Divisional record suggests that he had probably seen as much, or perhaps even more than the village's other casualties. He was 27 years of age. 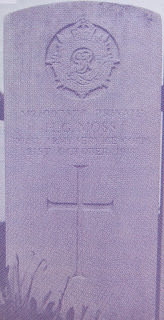 Henry George Moss is buried in the Roisel Communal Cemetery Extension, France; the grave is number 13, Plot 1, Row D. The Roisel cemetery is east of Péroone and south of Villers Faucon in the Somme region. It records the Great War burials of 721 UK soldiers, 106 Australian, 29 South African, 6 Canadian and about 50 Germans. George is commemorated locally on the village Memorial and on the Eton Church Gates Memorial. George Moss: The Commonwealth War Graves Commission page. Note. The Census for 1911 records him as George Henry, aged 20 and single working as a Footman (domestic) and living with his parents at Myrtle Cottage. He was one of 9 children who all were all alive on the day of the Census.